If ever there was a job that took more time to consider than actually physically tackling the task then this is it! 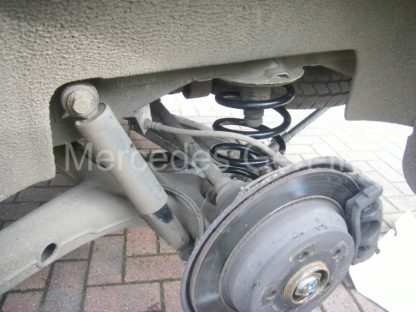 Replacement of the rear coil spring on the W639 Vito is ‘super-easy’ and should not be a problem for even the most inexperienced home mechanic, saving you a great deal of money in the process. 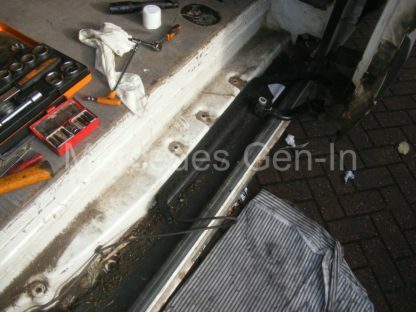 First jack up the rear of the vehicle from the sill end buffer (jacking point) nearest the rear wheel with the broken coil spring. 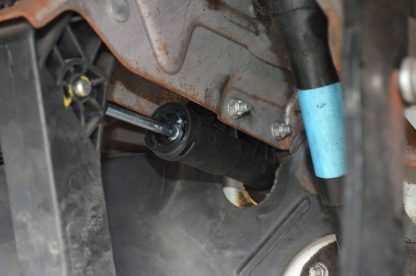 Remove the road wheel and place a stout wooden block beneath the swinging arm, directly under the spring cup and carefully lower the vehicle body on the jack. Lower it so that the swinging arm transfers some of the weight of the vehicle onto the wood. 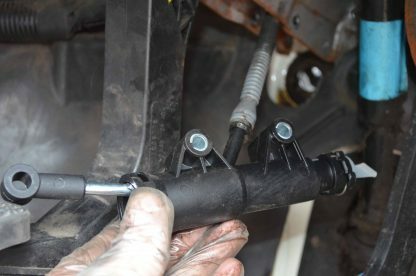 Now remove the lower shock absorber bolt (21mm socket and bar) from the swinging arm (or rear radius arm if you prefer that term). Jack the vehicle once again, up and away from the wooden block. Once raised, use a lever if needed to pry down the rear edge of the swinging arm to release the spring from the upper cup/bump stop. The spring will come out easily, usually along with the rubber cushion mounting pad, either top or bottom as it feels the need. 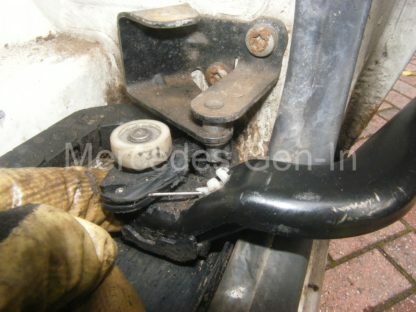 Simply re-fix the mounting pad to the new coil spring, lever down the swinging arm once more and insert the new spring. 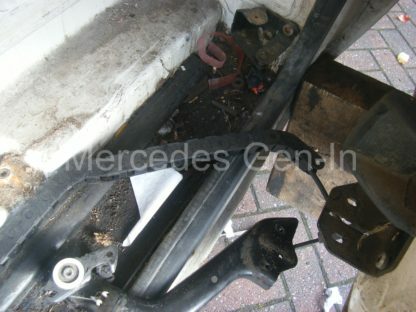 Place the wooden block under the swinging arm again and lower the vehicle carefully with the jack to take weight onto the block, beginning to compress the spring to a point where the lower shock absorber eye is parallel with the threaded portion in the arm so the bolt can be easily replaced and retightened. 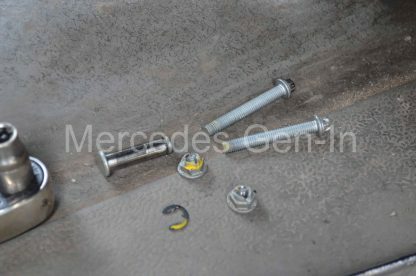 Check the ‘seating’ of the spring and if all is well – replace the road wheel and put the kettle on. 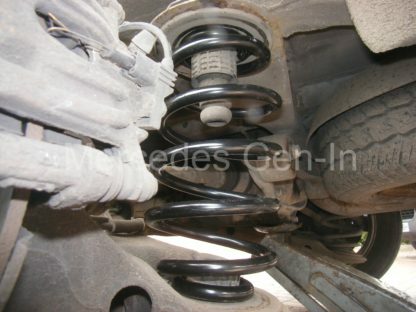 The Sachs OEM replacement springs (Sachs part number 627221840) that were used in this instance to replace the ‘stock springs’ were made of far heavier weight steel stock and did not taper in thickness towards the extremities of the coil ends as the original did. 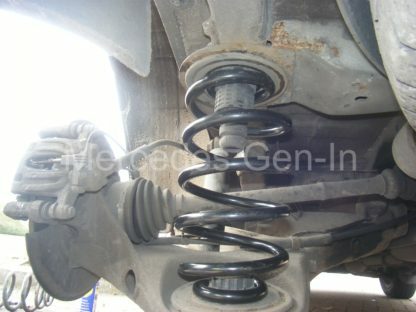 Assuming that because of this the new springs were rated as heavy-duty they would be best changed in pairs, its a simple job and there is really no excuse to change just one and have odd springs fitted on one axle – for peace of mind always change them in pairs! 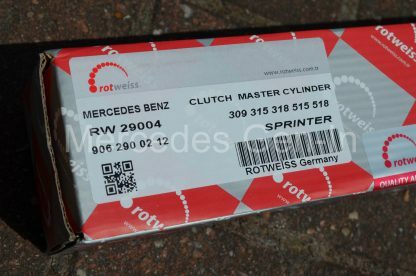 Sprinters up to model year 2006 share some similarity with the later model when it comes to ‘mysterious’ cutting-out and repeated intermittent non-start issues, this article covers specifically the earlier 4 cylinder Sprinter >2006, although some of the items covered are also common to the later model. The points covered here are some common failures and do not represent an exhaustive list of issues that may be causing problems with your vehicle. You may find at least some clues that help towards your own fault finding from the information given below. 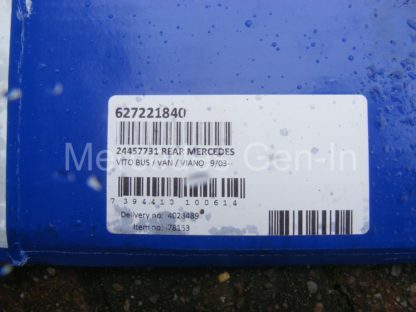 To start a Mercedes CDI diesel engine, there must be a set of conditions met that the ECU requires to initiate running the engine. The fuel rail must provide an absolute minimum cranking pressure of between 250 and 300 Bar, any less and the ECU will not allow the engine to start. 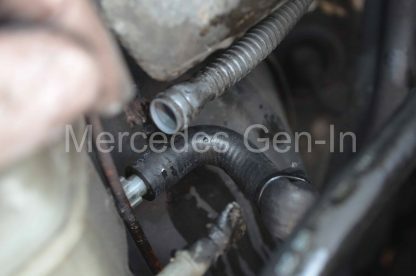 Causes for this pressure not to be maintained could be due to internally leaking injectors, faulty fuel pressure regulator or its O-ring seal (see covering article here), faulty rail pressure sensor, High or Low pressure fuel delivery pumps. 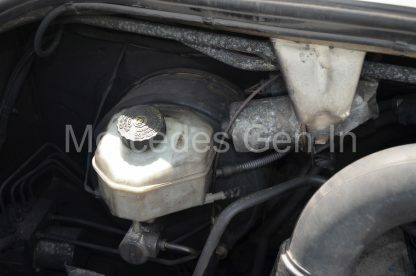 Equally any air resident in the fuel delivery system will hamper starting. Usually the seals used to terminate the clear plastic pipes from the low pressure to high pressure pump give rise to air bubbles visible in these pipes, which is not a good sign and will need to be further investigated. 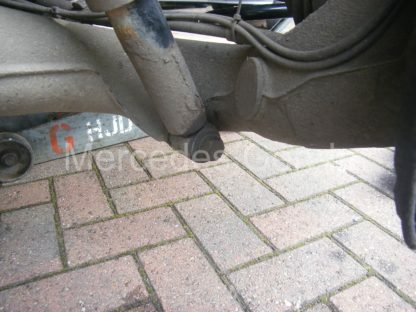 It is worth noting that unlike any circulating diesel feed system, the fuel exiting the high pressure pump is not self bleeding and any air held within the rail will take some time to clear should you open the system to atmosphere (for instance if you do a poor job of pre-filling a new fuel filter at service). It is worthy of note that the diesel pressures within the system of a running engine could be in excess of 1,600 Bar that is very capable of doing you some damage! 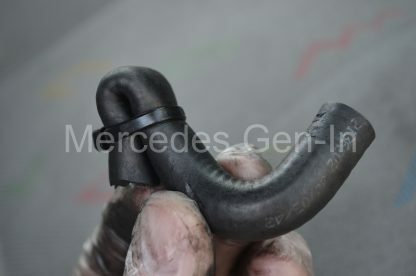 – always use caution when inspecting and working on running CDI fuel systems. Should at any point the measured pressure drop within the fuel rail, say if there were a serious ‘high-side’ leak or if you were to open a feed union to an injector the ECU would instantly cut the fuel delivery and shut down the engine as protection. Equally there is overpressure protection for the fuel system, where if it ever rises beyond a predetermined ‘safe limit’ the ECU operates the shut off valve on one of the three piston element heads of the HP diesel pump thus dramatically reducing delivered pressure to a safe level. This shut off device is the large tower like solenoid that extends from one element (there are three) of the high pressure pump, it has a two pin electrical connection and loom plug at its end. ‘Live data’ is the best way of determining fuel system pressures and the operation of the engines attached control devices, but obviously in a running engine. 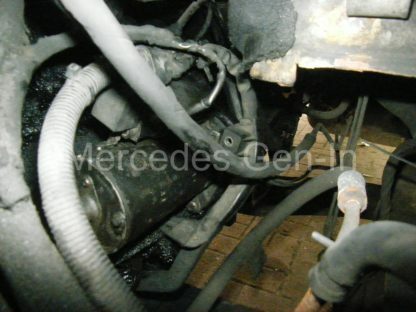 You will have to inspect the fuel system of a dead non-start engine using the functional details above as a guide. 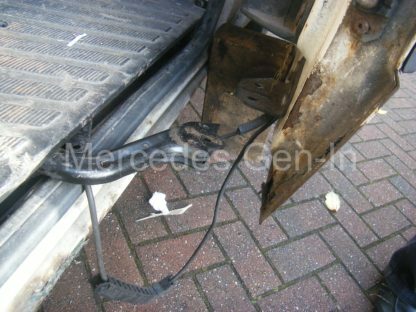 Unless you have a major fuel leak or the delivery pumps have catastrophically failed, fuel related problems are not often sudden and tend to show themselves as intermittent transient problems for a period of time before they get to the stage where the vehicle will no longer start. 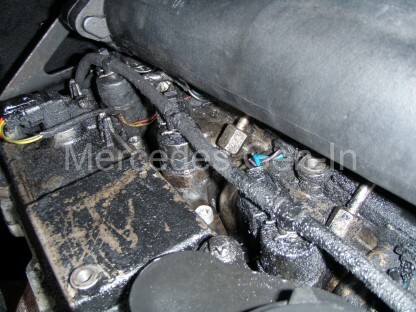 More often non-start problems arise from the electrical system. For the most part the electrical system will be the major cause of any none or poor starting issue. There are two main timing sensors fitted to the engine: Crank Position Sensor and Camshaft Position Sensor. These relay engine positional information to the ECU so that it can determine when to accurately fire the injectors so that the engine can run. Any synchronisation errors that occur between these two primary angle measuring devices will cause an engine to slip into limp home if running, and if stopped, the engine will not restart until it gets valid signals from both. 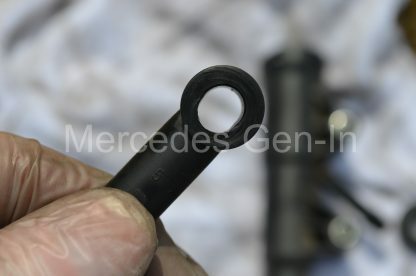 The cam position sensor is mounted on the top rear of the valve cover slightly to the left of cylinder 4 (rearmost looking in) and gets its positional signal from a lobe on the cam. Due to its location directly above the exhaust manifold, it is subjected to regular extremes of heat and daily cycles of hot and cold. 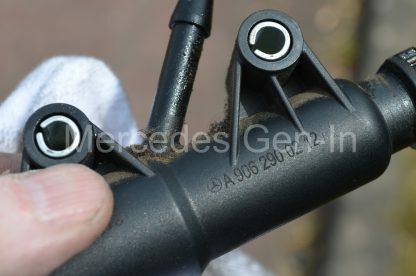 It is not uncommon for this sensor to exhibit thermal problems, where a cold engine will start and run fine, then once warm, would falter or not restart until cool. 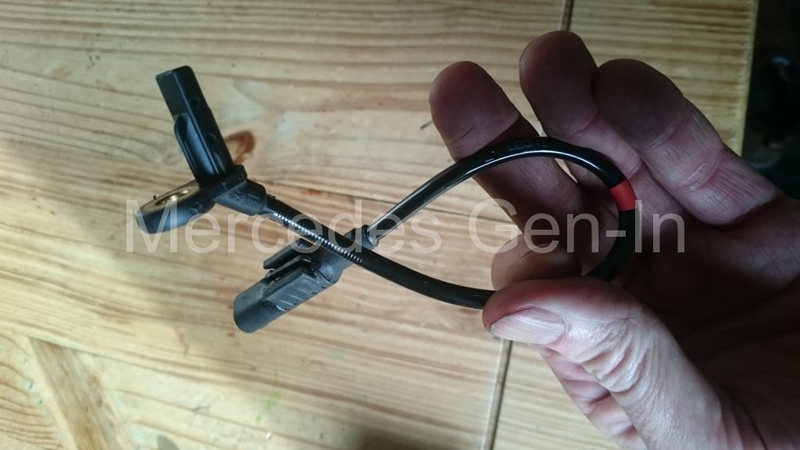 Replacement of this sensor is quite cheap – sub £30, and even if it does not cure any problems you may have, it is best to ‘eliminate it from enquiries’ if there are any synchronisation errors recorded. 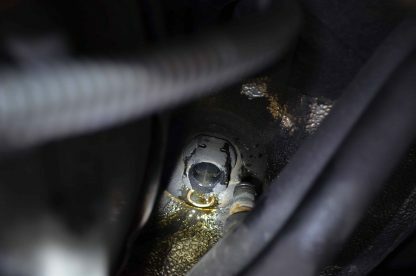 The crank sensor lives on the block seam of the engine and gearbox bell housing, just above the starter motor, it picks up its pulses from teeth on the flywheel. 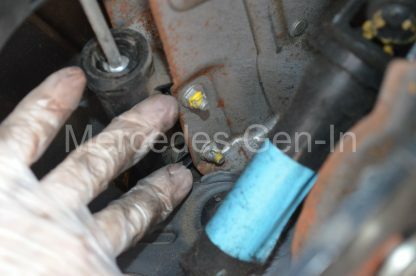 Generally it is quite reliable – if you have problems starting the vehicle it is often a good quick check to watch the tacho needle flick slightly as you crank the engine. If it flicks, then this is normally a sign of an impulse from the sensor reaching the ECU. If however the tacho needle does not flick on spinning the engine over, then suspect crank position sensor problems. It is possible this sensor can suffer from thermal problems but not as frequently seen as with the cam sensor. 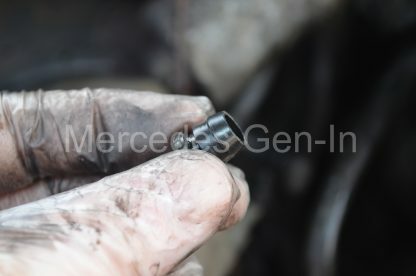 The connecors and cabling to the injectors are important things to check, if any connector to any single injector becomes disconnected, then the engine will not run, equally if one injector solenoid becomes disconnected when the engine is running the engine will die. 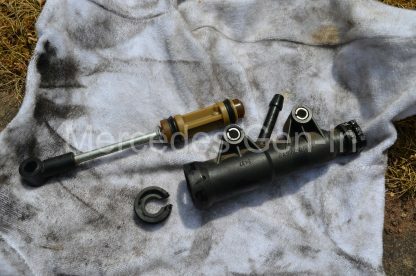 It is a known problem for the injector wiring loom that lies under the black plastic cable tray beneath the fuel rail to have issues whereby the injector cables rub and abrade against the metal surface of the alloy rocker cover over time. 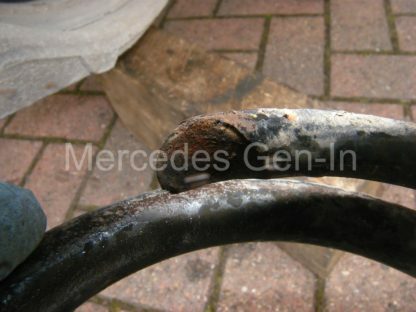 Once the cable insulation weakens and any of the conductors short to ground, it has a similar effect to disconnecting an injector – the engine will stop. 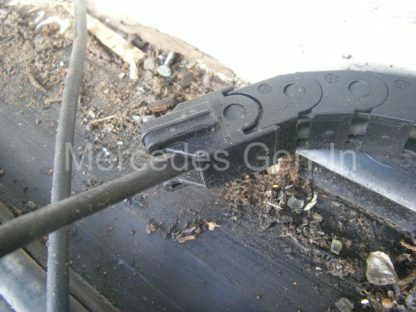 You can cut strips of plastic bottle and slide them under the cable tray to insulate the cable from the alloy cover to test if you suspect this is an issue. 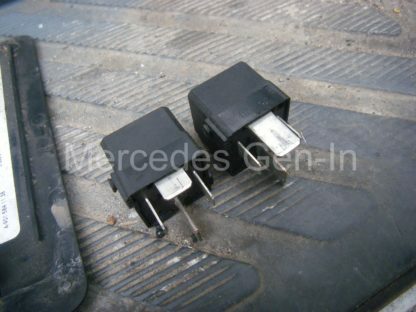 The injector solenoid wiring can be easily checked for continuity and insulation to ground by removing the injector connectors and metering out the wires directly to the ECU under the dash. 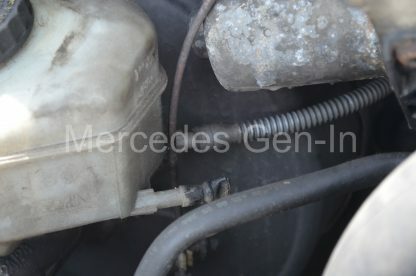 The injectors connections are the large gauge wires on the push in connector to the far right looking at the ECU under the dash. 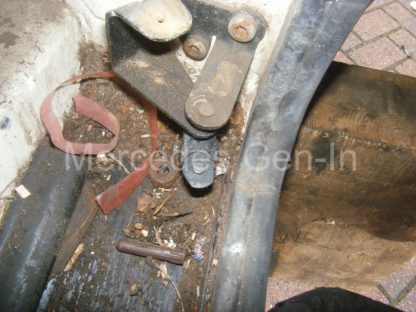 Release the ECU retaining springs to drop it down into the passenger footwell to make it easier to work on. 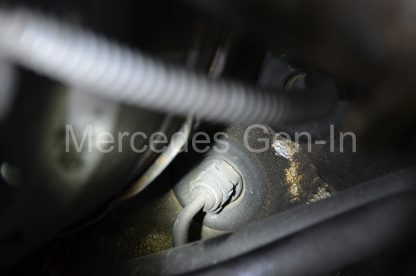 If you detect anything untoward with the wiring during your continuity checks, the first obviously place to look for broken cables and damage is to cut open the outer insulation on the section of loom that drops from the engine, over the left engine mount on its way to the rear of the battery shelf area. Here you will find the most mechanically vulnerable selection of sensor and engine management cables – be sure to check here first. 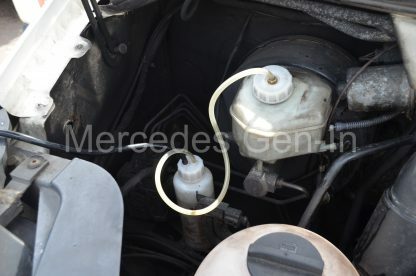 Note: although not related directly to non starting, as previously mentioned in other posts, the turbo control, vacuum solenoid valve loom, hooks round the front of the radiator from behind the passenger headlamp and travels across the front crossmember. 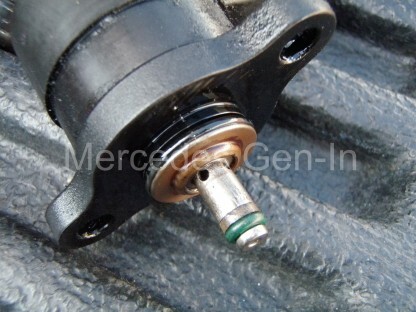 It passes the horn onward to the vac valve situated under the air box. 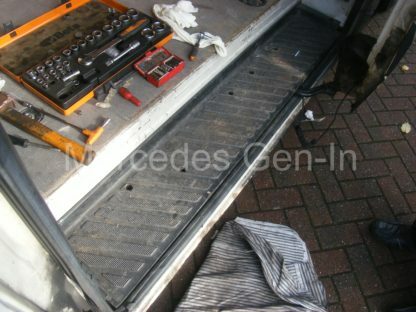 Commonly this loom is found to be damaged or broken in the area where it snakes past the headlamp tinwork on the front panel. See here for more related fault finding detail. 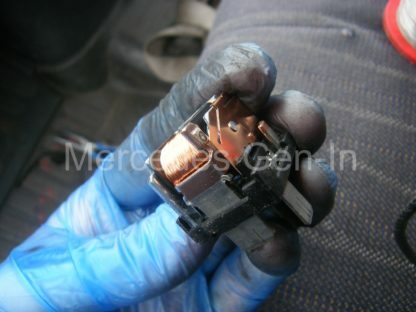 If all fuses prove good, and the engine cranks but will not fire, then take a look at the ECU connectors. 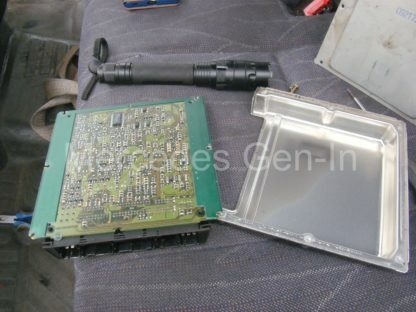 Remove each of the plugs and check that water, usually from a poor windscreen seal or rust-rotten screen surround, finds its way onto the ECU. 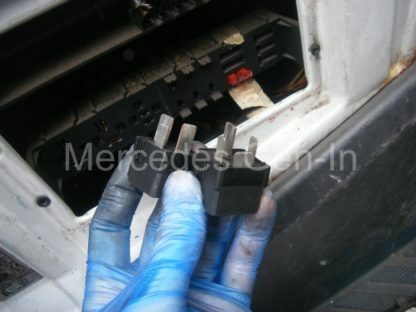 Over time the fine connectors and pins start to corrode and all manner or electrical issues ensue. To remove the ECU plugs with lever tabs, push in the small locking pip just behind the upright grey lever, on the black part of the shell. Then bring the grey lever down over it and continue to move the lever to the horizontal in an arc, this will eject the connector from the multiplug. I have had instances where intermittent cutting out has been due to dry joints on the PCB inside the ECU alloy box. To check this out – once all the cables have been removed undo the six torx head screws holding the cover plate onto the pressed aluminium ECU box. Once removed, lift off the plate and remove the PCB assembly from the pressed case. You can now inspect each pin solder joint with a magnifying glass to look for a broken or poorly soldered/corroded joints. 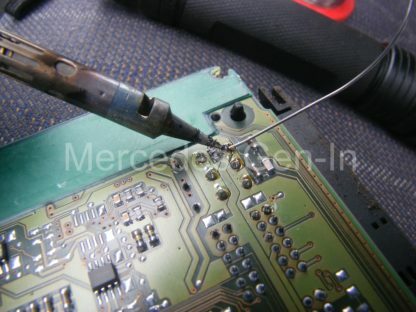 Often careful re-soldering of the suspect joint will provide a suitable repair, obviously if its corroded rather badly, the chances are that the multilayer board is damaged and at worst a replacement ECU could be needed (very rare). 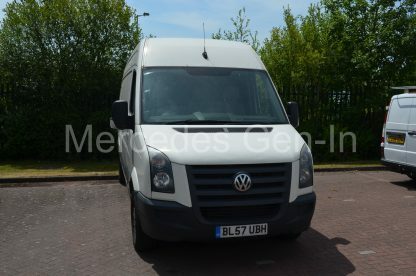 If you ever get any code reader messages relating to ‘capacitor voltage low’ (Autel or none-Star diagnostic tools) I have always found these to be a good indication of faults connected to the CPS, and after replacement or repair to its connecting wiring, it has always fixed the problem which was originally accompanied by an engine that will just cease running for no apparent reason. My first advice would be when the only recovered code is one relating to ‘capacitor low’ then more often than not – its related to the CPS and well worth a try first! If the starter does not crank at all, then it is good to understand that the start command is issued by the ECU and not the key! This is because the ECU monitors the key security module and will disallow starting unless a valid key (with correct internal chip) is being used in the ignition switch. Any problem that displays ‘KEY ERROR’ in the dash LCD module is connected to using an incorrect key, a broken or missing key code chip, or a problem with the key reader detection coil (around the ignition switch) or the key security module itself (SKREEM). If the key signal is valid the start signal will be actioned by the ECU. In auto versions it will also look to see if the transmission is in neutral or park. Once an ECU start output is active, the start relay is commanded. 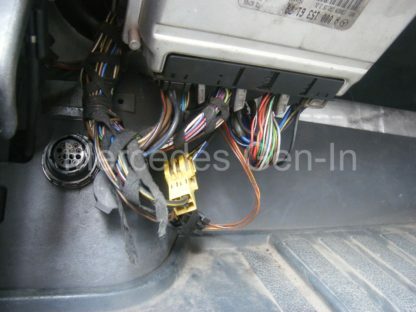 It lives beneath the driver seat, accessed through the flip off side panel, once caused to pull in – this puts voltage onto the coil of the starter motor, via a black with yellow tracer wire in the loom. I have seen odd instances where because of the nature of the size of the relay spades, they ‘give-way’ when pushed into the fuse board receptacle, pushing them up inside the relay case – misaligning the internal switch contact faces. 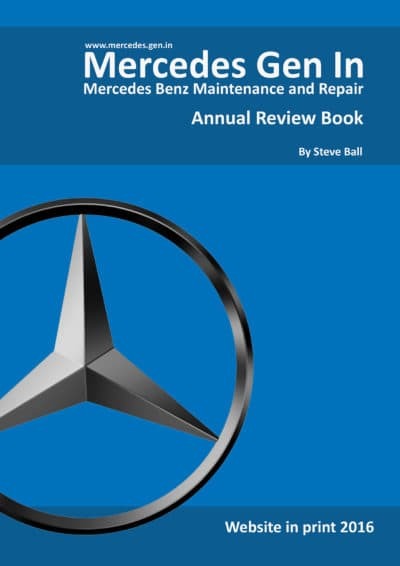 Often a root cause of intermittent starting/cranking with just a ‘click’ – should obviously the battery and starter cabling prove to be in good order. 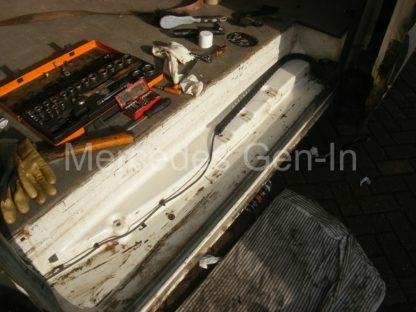 The dead giveaway here is if the headlamps stay bright and hardly dip when an attempt to crank is made, if it is not the relay and good voltage is reaching the stud terminal on the starter solenoid, then the chances are the solenoid itself is faulty and the starter would need replacement. 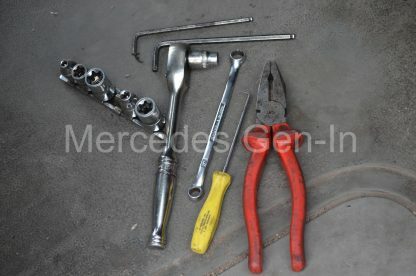 You can of course quickly test the starter by ensuring the vehicle is out of gear and then shorting the large 13mm power stud/nut on the starter to the smaller 10mm nut on the solenoid with a robust old spanner or jump lead clip. If the starter is healthy, then the motor should crank. If not, then you are most probably looking at a faulty starter motor. If it does crank, and will not turn over from the key, then you will have to investigate why following the information in the above text. 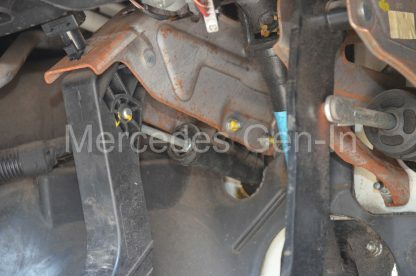 I hope the above gives you a little information to help you fault find a few little known anomalies with the Sprinter and hopefully it leads to identifying your starting issues.